UPDATE: Officials have charged Deonton A. Rogers, 29, in connection with a non-fatal shooting of a 29-year-old transgender woman on Detroit's west side. Rogers has been charged with several counts including firearm discharge, felon in possession of a firearm and felonious assault, officials say. 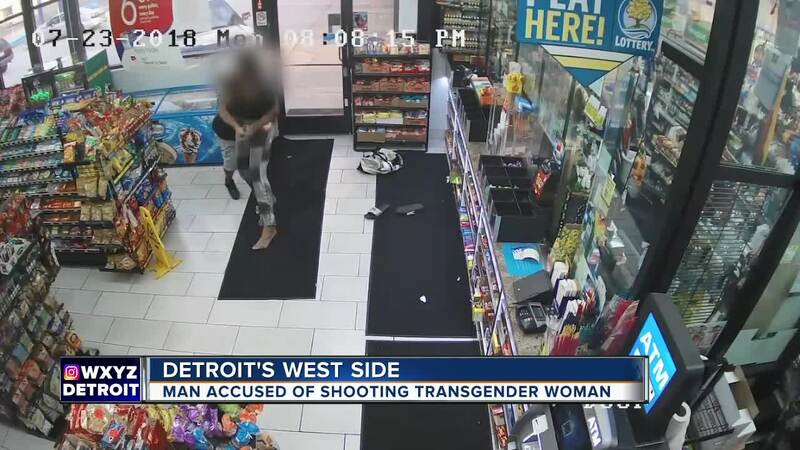 Authorities have released video of a suspect and a transgender woman struggling over a gun before the woman was shot on Detroit's west side. According to police, on Monday, July 23 at 8:05 p.m., a 29-year-old transgender woman was shot by an unknown suspect while inside of a gas station in the 15400 block of W. 7 Mile Road. The suspect and the woman had an exchange of words, which resulted in the suspect producing a weapon. Police say that's when the victim attempted to take the weapon away from the suspect before being shot. A struggle for the gun was captured on surveillance video. The victim was transported to a local hospital where her condition is currently unknown. If you have any information on this incident, please contact the Detroit Police Department's 12th Precinct at 313-596-1240, or Crime Stoppers at 1-800-SPEAK-UP.